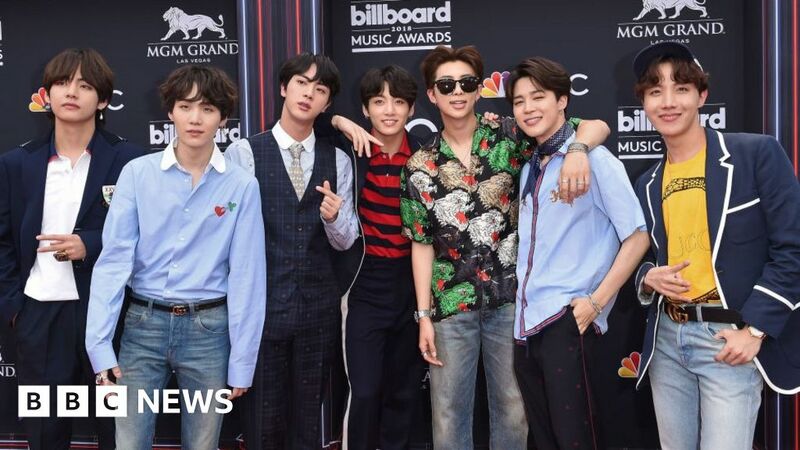 A Japanese TV show has cancelled an appearance by hugely popular K-pop group BTS, amid controversy over a shirt worn by one of the band members. A picture of Jimin wearing a T-shirt depicting the US atomic bombing of Japan, which killed hundreds of thousands of people, starting being shared online. It stirred anger among some Japanese BTS fans, who called it an “insult”. BTS later apologised to its fans for not being able to make an appearance. The “atomic bomb” T-shirt also featured Korean independence slogans. It was seen by some in Japan as celebrating the bomb which eventually led to the independence of the Korean peninsula from Japanese colonial rule. Japan and Korea’s shared wartime history remains an extremely sensitive topic in both countries. BTS, a seven-member Korean pop group, was originally scheduled to perform on TV Asahi’s Music Station show on 9 November. “A t-shirt design worn by one of the members caused controversy… we had been discussing it with the record label. However, we decided to postpone their appearance this time,” said TV Asahi in a statement published online. It is unclear when exactly Jimin wore the shirt in question, but pictures of him in it started circulating online in October. The shirt, which is still available for sale online, bears the slogan “Patriotism Our History Liberation Korea” and features an iconic photo of the atomic bomb dropped on a Japanese city. During the Second World War in 1945, two atomic bombs were dropped on the Japanese cities of Hiroshima and Nagasaki – the first and only time atomic bombs were used in a war. Hundreds of thousands of people were killed instantly and many more died in the years to come as a result of radiation sickness. The bombings led to Japan’s surrender and the end of World War Two in Asia- as well as the end of Japan’s colonial rule of the Korean peninsula which begin in 1910. There are conflicting reports as to when exactly Jimin wore the shirt. Some Korean media reports say it was worn last year while others say he wore it on 15 August this year to mark Korea’s Liberation Day. Photos of Jimin in the shirt started to gain traction on social media in early November. It wasn’t long before the Japanese words for #Unforgiveable and #AtomicBomb started trending on Twitter – and some Japanese social media users were furious. “I am a resident of Hiroshima, I will not allow BTS to appear on the music station. They made a joke of the atomic bomb,” one Twitter user had said ahead of the cancelled performance. But other fans rallied around BTS. “Don’t be sad, this is not your fault, the [tense relations] between both countries is beyond your control… Jimin don’t blame yourself,” said one Twitter user. The cancellation comes as ties between Japan and Korea have becoming increasingly strained in recent years. Earlier this week, a South Korean court ordered a Japanese company to compensate them for wartime labour during Japan’s colonial rule of the Korean peninsula. However, Tokyo maintains the issue of compensation has been settled under an agreement attached to a treaty that was signed in 1965, calling the ruling “unbelievable”.